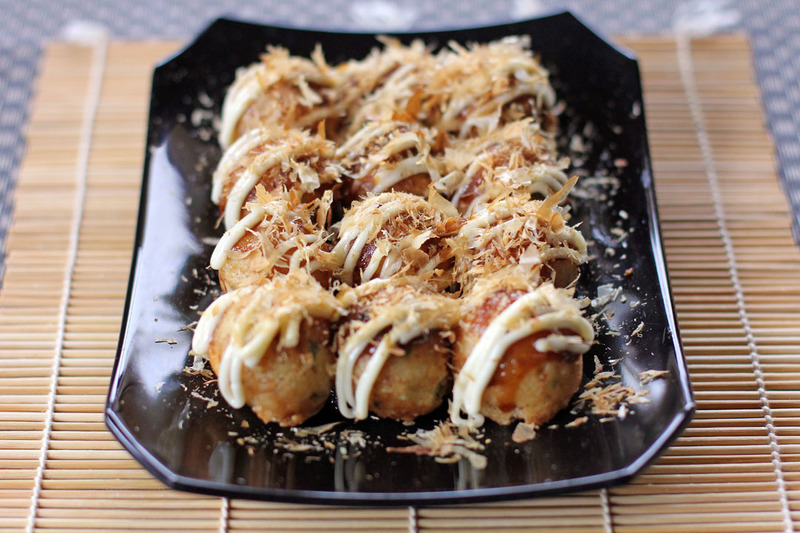 Takoyaki is one of my favourite Japanese street food, it is a type of dumpling filled with baby octopus, cabbage, spring onions and pickled ginger. It is then cooked in a takoyaki pan then served with takoyaki sauce, mayonnaise, aonori and katsuobushi (dried bonito shavings). It was invented by Tomekichi Endo in 1935, he popularized it in the streets of Osaka and was inspired from Akashiyaki which is a softer variant, contains more eggs and is dipped in dashi. If you noticed it has the common prefix (yakitori and yakisoba) and suffix (teppanyaki, teriyaki and sukiyaki) that other Japanese dishes also used which is “Yaki”, a term derived from “yaku” that describes a cooking method which is to fry or grill. A very good side dish to Japanese dishes or even as a snack, these dumplings are so soft and tasty. This is one of my addictions, when I see this in Japanese restaurants and even in Japanese food stalls I am always tempted to buy a serving or two. Best enjoyed straight from the pan while they are very hot. Combine flour, baking powder, salt, sugar in a mixing bowl. Add eggs and dashi stock and mix until it forms a smooth batter. Cover bowl with cling wrap then set aside and let it rise for 30 minutes. Lightly brush takoyaki pan with oil, heat up the pan using low heat. Pour batter into the pan up to the rim then add 2 pieces of baby octopus slices, pinch of ginger, cabbage and green onions in the middle. Once the batter rises, using a toothpick loosen the dumplings and flip it to the other side. Don’t worry about the shape, it will set in the bottom and finally creating a full sphere. Once the other side sets, loosen it again with toothpicks then keep on rotating for 5 minutes or until dumplings are golden and crispy. Once cooked place in plate brush with takoyaki sauce, top with mayonnaise and dried bonito flakes. The moment I saw baby octopus and cabbage together I knew I had to make these even if I did not possess the said takoyaki pan: where there is the will there will be a way 🙂 ! May make them slightly less Oriental as I do not use Japanese or any other mayo, but this is a street food I have never met in the Land of the Rising Sun 🙂 ! Such a flavorful and interesting little treat. Amazing they can make something so involved as street food. OMG, these look amazing, will have to try them one day soon. Thanks for sharing. I LUURRVE Takoyaki! I might just get the takoyaki pan to try this. Thank u for the recipe! I would love to try one of these, you’ve totally sold me on them. Thanks for sharing! 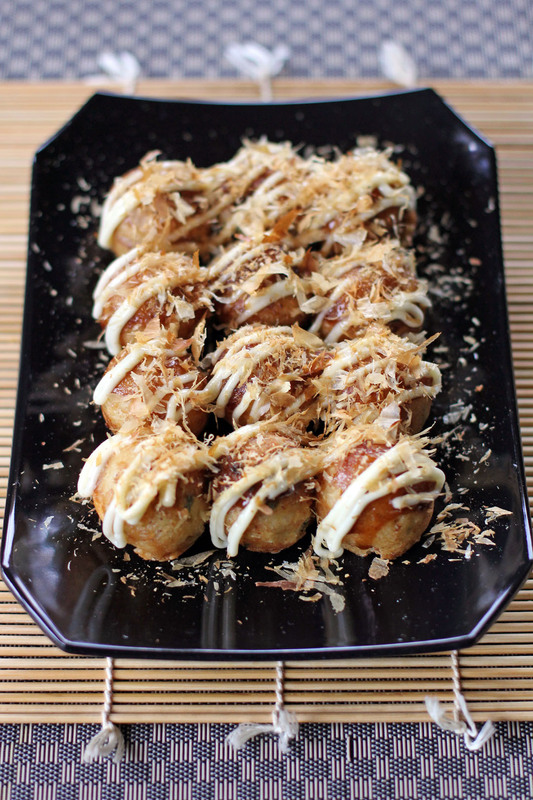 Love Takoyaki: and you make them look so easy to make! There’s lotsbin Fresh and save North Shore. I am not sure of the exact location in the Philippines as I reside in New Zealand but I am sure when I was there Rustans have a lot of specialty imported producta so give it a try there.